Summerhill has been providing interior design services as a direct result of client requests. We think almost everyone could benefit from some sage advice delivered by a knowledgeable designer. How often are each of us caught in that design dilemma, unable to move forward with a plan simply because we cannot solve that one creative problem? And who among us hasn’t charged through with a design project with the express desire to “just get this finished” only to end up with problematic furnishings that don’t quite hit the mark? We didn’t begin the shop with a desire to offer interor design services. But slowly, through the years, and after much deliberation, Summerhill began referring designers to our clients with whom we’ve had a long relationship. This has proved to be quite beneficial not only to our clientele but also to us. Now it’s widely known that the designers we refer are quite adept at determining the needs of the client and quickly imagining solutions. We caution prospective clients to be ready for the process. It’s become an important element of our service to move rapidly in implementing design decisions, whether it be in color selection, upholstery fabrics, pillows, bedding or, of course, furnishings. Summerhill offers full service design as well – soup to nuts, floor to ceiling, all design projects petite and grand. We have a long “wish list” which we use every time we buy inventory. 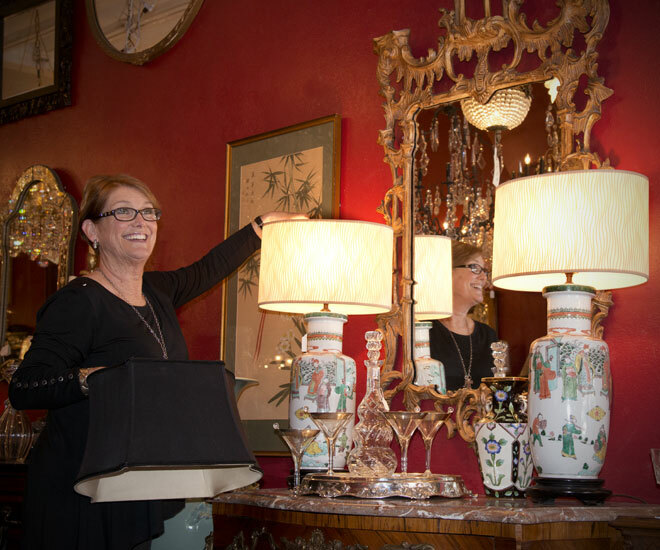 Our designers are notified at once when we’ve secured a fine piece of furniture or that dramatic chandelier with matching sconces. And we actively search for items requested by our clients as well. And there are times when room arrangement is all that’s needed. We offer that simple design service as well. It’s really our favorite service, taking our clients good choices and displaying them in such a way that each piece enhances the whole. This design process is an art, you’re either born with this ability or you’re not. Most of us who enjoy interior design know how to buy beautiful things. However few of us truly understand how to pull it together to maximize the beauty and symmetry of handcrafted pieces, unique and personal. You are invited to call for an appointment to have a personal discussion with a designer. No project is too small. And if all you need is a freshened look, our designers are here to help out.